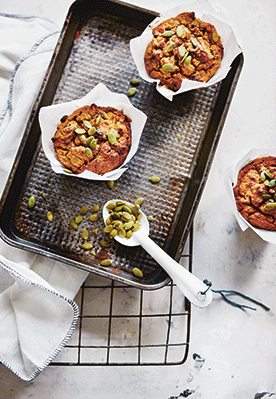 These flourless muffins are packed full of protein from the use of ground almonds. They are a great breakfast if you are trying to avoid sugar as these muffins only use the sweetness of banana and dried cranberries. Make sure you use overly ripe bananas so the mixture has a soft consistency and a sweet flavour. 1. Preheat the oven to 180°C fan/400°F/ Gas 6. Line a muffin tin (pan) with paper cases. 2. In a large bowl, combine all the ingredients and thoroughly stir together, making sure all the ingredients are incorporated. 3. Transfer the batter to the muffin cases and sprinkle each with pumpkin seeds. 4. Bake for 30 minutes or until cooked through and the centres spring back when lightly pressed.